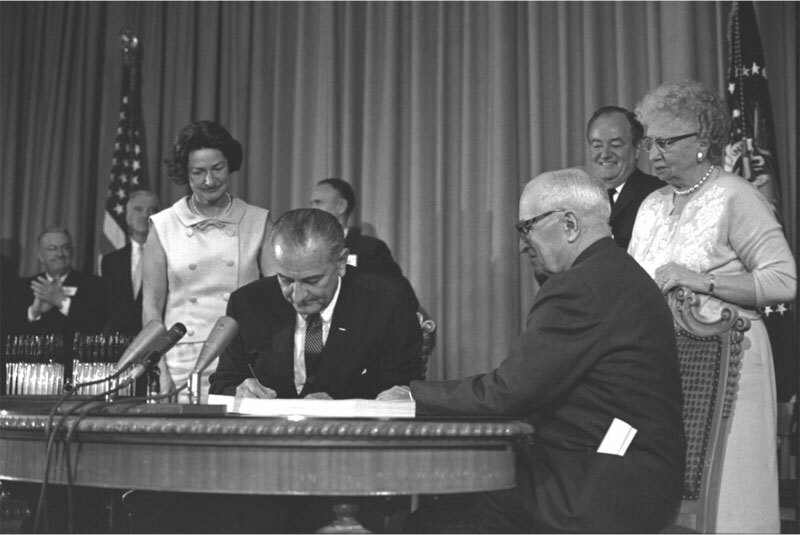 President Lyndon B. Johnson signing the Medicare bill at the Harry S. Truman Library in Independence, Missouri, on July 30, 1965, with President Truman seated next to him. Behind President Truman is his wife, Bess, and the vice president, Hubert H. Humphrey. Behind President Johnson is his wife, Lady Bird Johnson. Archive photo from the White House Press Office. The American Medical Association (AMA) initially supported insurance plans financed by the states and workers’ contributions. It employed Isaac Rubinow, a physician and economist who was a leading expert on social insurance, to conduct research and advocacy on behalf of a policy to expand Americans’ access to health care. The AMA’s support dissipated during World War I, however, because of both public opinion that disdained any policy of German origin and anxiety among physician members that government spending for health care might threaten their clinical and financial autonomy. The AMA and its state delegates were stridently opposed to the CCMC’s recommendations for new policies expanding access to health care. Nevertheless, late in 1932, supporters of the CCMC recommendations tried, but failed, to include them in the Social Security Act of 1935. President Franklin D. Roosevelt feared that if he included them, the AMA and its affiliates would try to defeat the entire bill and, hence, pensions for the elderly. It should be noted, however, that the Social Security Act did include federal support to the states for public health activities and services. In 1943 Senators Robert Wagner (D-NY) and James Murray (D-MT) and Congressman John Dingell Sr. (D-MI) introduced a bill, which died in committee, to create a compulsory health insurance program. By 1945, when Truman announced his 5 critical goals for health policy, he could draw on a wealth of data documenting the success of the additional expansion of access during the war. This evidence emerged from policies to expand access to care for pregnant wives of men in the armed services, tax subsidies for health insurance as part of wartime labor policy, the expansion and support of medical education, plans for increasing access to care for wounded and injured armed service members, and plans for legislation to subsidize returning veterans’ training for jobs, which included many in the health professions. To achieve the last 2 goals, Truman proposed that every wage-earning American pay monthly fees or taxes to cover the cost of medical expenses and for payments to replace income lost as a result of illness or injury. Truman insisted that he was not proposing “socialized medicine” because “the American people want no such system.”3 Senators Wagner and Murray and Congressman Dingell once again introduced health reform legislation, now focused on Truman’s goals. Almost as soon as they introduced their bill, the AMA capitalized on anxiety about what would soon be labeled the “Cold War,” to attack it as “socialized medicine” proposed by “followers of the Moscow party line.” The bill became a dead issue when, as a result of the midterm elections of 1946, the Republicans regained control of both the Senate and the House for the first time since 1929. There was, however, bipartisan support in 1946 for the passage of the Hill-Burton Act, which successfully implemented the first of Truman’s goals by subsidizing the expansion and renovation of hospitals and clinical facilities, especially in rural and suburban areas. Even after Harry Truman’s reelection in 1948, along with a Democratic Congress, the AMA’s intensifying lobbying and advertising stymied him and his allies who supported new and more equitable health policies. The AMA recruited as ideological partners 1,800 national organizations, including the American Bar Association, the American Legion, and the American Farm Bureau Federation. But the vast expansion of tax-subsidized voluntary insurance linked to employment after the war brought new attention to the limits of Americans’ access to care. For example, as Truman was leaving office in 1952, a committee he had appointed recommended federally subsidized insurance for the elderly, who lost their health benefits when they retired. Moreover, in the early 1950s, the states’ expansion of payments to vendors of health care, using federal funds or grants, on behalf of the “medically indigent” began the politics of what eventually emerged as Medicaid in the mid-1960s. This summary of complicated events makes it possible to imagine Truman’s difficult job of expanding access to health care while he was the president of the United States. Indeed, Truman expressed great joy when LBJ signed the Medicare and Medicaid Act of 1965, which came as close as politically possible to creating the programs he had advocated in 1945. The nation had to wait another 45 years for the Patient Protection and Affordable Care Act of 2010, which achieved even more of what Truman and many others had sought for so long. This is also a story that, in many ways, informs each of the articles we present in the March 2015 issue of The Milbank Quarterly. Beginning with this issue, the population health policy expert, David A. Kindig, joins our distinguished panel of Op-Ed columnists. In the third installment of this section, you will find a cogent discussion of the increasing role our damage to the environment plays in the public’s health. Also featured are essays on the challenges of negotiating a common ground for health policies that help all Americans, regardless of what side of the political aisle they may inhabit; the importance of keeping promises made when proposing complex health policies; the increasing and important role of women in delivering health care; the pitfalls of health care lobbyists; public health laws related to quarantine and epidemic emergencies; the future of the community health centers program; and the reduction of medical errors through private and public cooperation. Our lead article, by Elizabeth M. Badley, Mayilee Canizares, Anthony V. Perruccio, Sheilah Hogg-Johnson, and Monique A.M. Gignac, is a longitudinal cohort study of benefits gained and lost when comparing the self-rated health assessments of Canadian “baby boomers” with those of other generations. Badley and her colleagues refute the conventional wisdom that baby boomers are (and will remain) healthier than previous generations. Specifically, they found that the health effects of the baby boomers’ better education, higher income, and lower smoking rates were nearly counterbalanced by the adverse effect of increasing body mass index (BMI) and the concomitant health problems associated with obesity. Consequently, assumptions that improvements in education and prosperity will reduce the baby boomer generation’s health care needs over time may fall short of what was predicted. Julia A. Wolfson, Sarah E. Gollust, Jeff Niederdeppe, and Colleen L. Barry studied the American public’s views of parents of obese children in a milieu in which policies and strategies are being developed to reduce childhood obesity. They found both American men and women—those with, as well as those without, children in the household—consider such parents to be largely to blame for their children’s obesity. That said, the robust attributions of responsibility to parents for reducing their children’s obesity did not universally undermine support for broader policy action. School-based obesity prevention policies, for example, were strongly supported by the American public, even by those who viewed parents as being mostly to blame for their children’s obesity. Wolfson and her colleagues also found that Americans who viewed sectors outside the family to be involved in helping address this public health problem (eg, the food and beverage industry, the schools, and the government) were more willing to support a wider range of population-based obesity prevention policies. Nancy R. Kressin and Peter W. Groeneveld conducted a systematic review of race and ethnicity and the overuse of health care services and interventions that do not necessarily improve patient outcomes. Although overuse of care was not invariably associated with race and/or ethnicity, Kressin and Groeneveld did find that when it was, a substantial proportion of studies found a greater overuse of care among white patients. They also reported that PubMed, the major index of the peer-reviewed medical and health literature, has not yet established subject terms for the overuse of care or inappropriate care, which may impede efforts to study this essential problem and develop the means to correct it. Marian Moser Jones documents the creation of the “science of homelessness” during the Ronald Reagan era. She demonstrates how politics can influence social and behavioral science research agendas. Research sponsored by the National Institute of Mental Health and other federal research agencies during the 1980s produced a social “snapshot” of mental illness and substance abuse prevalence among the US homeless populations. Such findings led to many private foundations supporting projects focusing on the health care needs of the homeless. Yet because the Reagan administration opposed the funding of “social research,” together with the lack of private-sector support for such research, relatively few studies examined the relationship between homelessness and structural factors such as housing, employment, and social services. These distortions, shaped by the Reagan administration’s policies and reflecting social and behavioral scientists’ long-standing tendencies to emphasize individual and cultural rather than structural aspects of poverty, resulted in fragmenting homelessness research and policy in enduring ways. Finally, we come full circle to the contingencies of history and health policy in the United States that began this issue’s introduction. Daniel M. Fox looks at how public policies, from the 19th century to the Affordable Care Act era, have paradoxically helped commercialize nonprofit health enterprises. He argues that this paradox persists as a result of consensus on its value for both population health and the revenue of individuals and organizations in the health sector. Underlying this consensus, Fox explains, are several factors, including assumptions about the burden of disease and how to address it as well as the effects of biomedical science as it translates into professional education, practice, and the organization of health services on the prevention, diagnosis, treatment, and management of illness. This policy paradox has incentivized the growth and commercialization of nonprofits in the health sector since the late 19th century and remains influential in health policy today, especially regarding the allocation of resources. Fox ends his analysis, and our Spring issue, with the hopeful note that several aspects of the ACA’s implementation may help constrain these paradoxical effects. Remarks with President Truman at the signing in Independence (MO) of the Medicare bill. July 30, 1965. In: Lyndon B. Johnson. 1965: Containing the Public Messages, Speeches and Statements of the President of the United States. Book 2. Washington, DC: Office of the Federal Register, National Archives and Records Service, General Services Administration, US Government Printing Office; 1966:811-815. Truman HS. Memoirs: Years of Trial and Hope. Vol. 2. Garden City, NY: Doubleday; 1956:23. Special message recommending a comprehensive health program. November 19, 1945. In: Harry S. Truman. 1945: Containing the Public Messages, Speeches and Statements of the President, April 12 to December 31, 1945. Washington, DC: Office of the Federal Register, National Archives and Records Service, General Services Administration, US Government Printing Office; 1961:475-491. Poen M. Harry S. Truman Versus the Medical Lobby: The Genesis of Medicare. Columbia, MO: University of Missouri Press; 1979:3. Fox DM. Health Policies, Health Politics: The British and American Experience, 1911-1965. Princeton, NJ: Princeton University Press; 1986.